Home / German Football / General / Rakuten announces new partnership with Lukas Podolski! 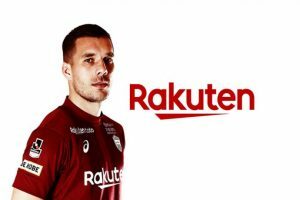 Rakuten, Inc. has announced a 4-year partnership with football star Lukas Podolski, appointing the Vissel Kobe player and former German national team forward as Global Brand Ambassador for Rakuten. The partnership covers many fields including e-commerce, exclusive content, Viber integration and support of Podolski’s charity work in his home country, Germany and much more. Delivering on the mission of “digitalization and innovation for fans,” Rakuten and Podolski will work together to deliver innovative products for football players and fans in the digital world. These projects and products will be launched in the coming months, starting with the opening of a “Strassenkicker” (Podolski’s streetwear fashion label) online shop on Rakuten’s German marketplace. Podolski’s activities as Rakuten’s brand ambassador will mostly focus on the German market, where Rakuten is active with most of its global brands and services, such as the Rakuten marketplace, Rakuten Viber, Rakuten TV and Rakuten Kobo. “The partnership with Rakuten means a lot to me because it connects my football country of Japan with my home country, Germany. I am very impressed by everything that Mickey Mikitani has created with Rakuten and the visions he is pursuing – and I’m very honored to be part of it,” said Podolski. The partnership was announced at the “Schauinsland-Reisen Cup 2019 – Kicking for a good cause” event held on January 13 in Gummersbach, Germany. The soccer cup is sponsored by the Lukas Podolski Foundation, and Rakuten supported the event as one of its main sponsors. Previous Mohammedan Sporting Club sign Ghana defender Moses Zutah! Next VIDEO – DW @ 2019 AFC Asian Cup: India 0-1 Bahrain UNCUT!